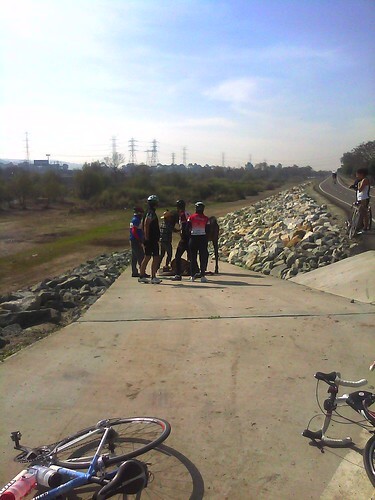 A few months ago I went on my first intermediate distance group bike ride in Duarte. 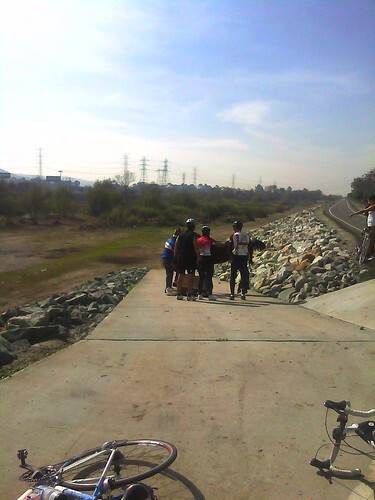 We planned to cycle about 20-30 miles, out and back, on the San Gabriel River Trail (SGRT). It was drizzling that day and never quite let up the whole time we were riding, so we turned back sooner than initially planned and returned to our point of origin, soaked, yet hopeful to try again when the weather was better. This month I had a chance to ride the SGRT again. The plan was to ride between 30-40 miles, out and back, on the same route as the last attempt. We rode a lot further though, due to an underestimation of a mutually agreed-upon turnaround point some distance just past the halfway point. What made it even more challenging for me, being both the farthest I’d ridden and at a faster average speed, was that I had only a single bottle of water with me for what turned into a 4 hour ride. 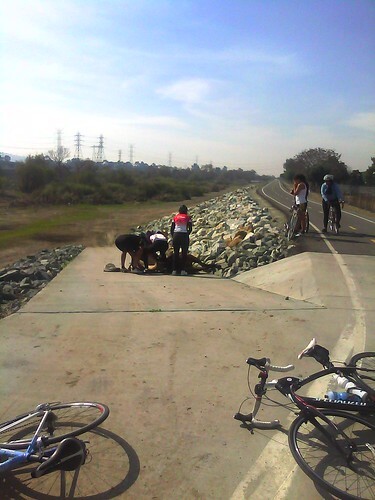 We stopped and rested for a bit at a peaceful park in Downey and headed back toward Duarte, but my water bottle was close to empty when we were still out about 20 miles. Fortunately I was riding with more experienced riders, who were more than happy to offer a bit of their nutrition bars– Peanut Butter Powerbars, FTW!– and unused hydration. They were also full of encouragement as I progressed along the trail and let me set the group’s pace on the way back. This was great because I felt tired, hungry, and my energy level was as shaky as my legs which had been spinning my bike pedals for hours by that point. I wanted to be done more than anything. About 11 miles out we came upon a strange site and jumped off our bikes. 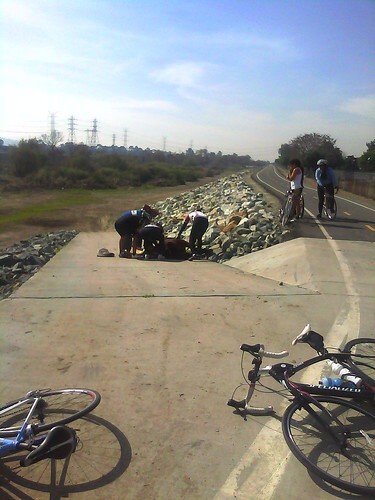 We saw a horse lying on its side, so we moved closer to find out what happened. It was a very sad scene to happen upon. My teammates immediately offered to help right the fallen horse. It lay very still and I wasn’t sure what was wrong with it or if it was going to make it. Turns out the saddle made the horse too top heavy. As soon as it was unstrapped and pulled off, with a little encouragement the horse quickly found the energy to stand on its own. The horse was led down the ramp to the soft dirt below. Perhaps the horse shoes were not the proper fit or otherwise not fit for the cement trail and the poor thing slipped and fell. Back to the ride, after saying farewell to our new equine friend. We had 11 more miles to our path’s end. The rest of the ride was uneventful and the next thing I did upon finishing the ride and immediately downing another half bottle of water from my car, was to make a beeline to IHOP with my bike group. We rode 50 miles and were proud of our achievement! I also had a very sore bum which would continue for the next couple days, but it’s fine now. I look forward to the next ride wherever that may be. Until then there’s no place like home.